Eastbourne AM is committed to helping worthwhile causes in Eastbourne, in the UK and around the world. 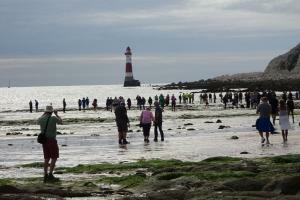 Now in its sixth year, the annual walk around the lighthouse this year is on Saturday 4th May 2019. The “Tree of Light” is covered in a host of white lights and dressed with white ribbons in memory of loved ones. The Rotary Club of Eastbourne AM is a fun, vibrant service organisation made up of individuals and couples from all walks of life. We have all been brought together by our enthusiasm for fundraising and a desire to help people in our community but the main thing we all share is our passion for enjoying ourselves! If you are interested in seeing what our club is all about, we would love to see you at a Friday breakfast meeting. We meet at the Chalk Farm Hotel, Willingdon at 7:15am. We finish at around 8:30am with plenty of time to get to work.